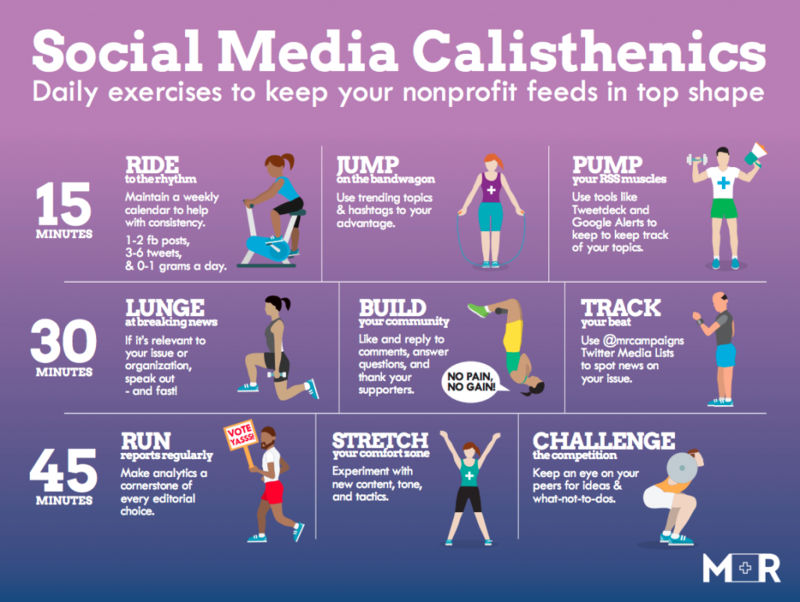 Running an effective social media program is a marathon, and also a sprint, and also requires leaping over hurdles. Sometimes it feels like there’s no time to squeeze in the good practices you know are going to keep your social media communities performing in top shape for your cause. So we’ve put together a little exercise regimen to help make the most of every minute and keep moving forward toward our goals. 1. Ride to the rhythm. No matter what new twists Facebook has up its sleeve, the best way to keep pace with the algorithm is to post engagement-driven content regularly. There are moments (big policy days, events, Twitter chats) when it makes sense for your organization to post a lot in one day. But normally we see the social sweet-spot being 1-2 Facebook posts, 3-6 tweets, and 0-1 grams per day. 2. Jump on the bandwagon by posting content that is driven by your social media monitoring: Listen to what your community is talking about and share/retweet content that resonates most. Tap into weekly hashtags like #mm (motivation monday), #ww (wonderful weekend), #tbt (throwback thursday), #ff (follow friday), or trending hashtags like #trumpshutdown #dreamers. These will both help your posts be more engaging and attract more supporters to your feed and organization. 3. Pump your RSS muscles. It’s not possible to pay attention to everything and everyone in your organization and issue’s orbit. We lean on tools like Tweetdeck and Google Alerts to filter what we need to know so we can quickly find what we want to engage with and share each day. 4. Lunge at breaking news. Some of the highest engaging posts we see are posts about news stories that either feature organizations or the causes they work on. Easily share these posts on Facebook and add your personal reaction to the copy. When you tweet, tag the reporter so you can build your relationship. 5. Build your community. Taking the time to share posts from your peers, reply to posts from your influencers, and respond to comments and DMs from your supporters may be more valuable for your feed than taking time to create your next post. It’s not called social media for nothin’. 6. Track your beat. New people come on the Twitter scene all the time. When those people are talking about your cause, you want them to know you. So we like to occasionally step back and look for who’s new to engage with and then add them to our private Tweetdeck or public Twitter lists. M+R’s social squad also gave you a headstart and made Twitter Media Lists of the top reporters covering 13 common nonprofit news beats for you to follow. 7. Run a report of your social media results and learn from how your posts are performing. Here’s another M+R blog post that walks through what to look for once you get that sweet data. 8. Stretch your comfort zone. Your Facebook page is a wonderful and low-risk place to try out a new message, photo, or action with your audience. If you’re feeling stuck in a rut with your posts, give M+R’s Social Media Content Generator a spin. It’s like playing roulette but with nothing to lose. 9. Challenge the competition. Review what’s happening in the social community you’re a part of. What do you see that you like? What do you see that you can do better? By treating your social media posts and engagement like a competition with goals, you can up your social game one tweet at a time. Amazing! You can get a full workout and do all the exercises. Here’s an updated and printer-ready pdf of all 9 exercises for you to keep somewhere handy.